Thyme for Cooking Dinner tonight: Pork Tenderloin, Sweet and Sour Cabbage. The brown sugar and vinegar treatment is more typical of red cabbage but works just as well with white. 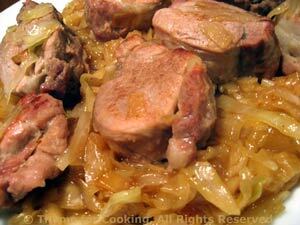 The pork tenderloin is thickly sliced, quickly browned and finished with the cabbage. You could substitute pork chops if you prefer. 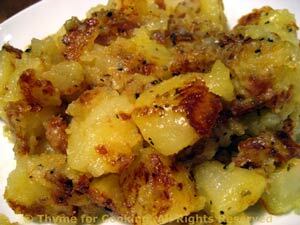 Fried, Smashed Potatoes round out the meal. Cook the brown rice for tomorrow night.